If you love history, then Durham is steeped in it. This medieval city is in the heart of the north east of England and is host to one of the oldest universities in the United Kingdom that ranks alongside Oxford and Cambridge as an ancient seat of learning. Of course, the crowning glory of this UNESCO World Heritage site is its magnificent Norman Cathedral, which sits high above the city, adjacent to Durham Castle while the natural bend in the River Wear wends its way around the city and protects it on three sides. The 11th century Anglican Cathedral is dedicated to St. Mary and took over one hundred years to construct on the site of at least two other churches previously built there and is the final resting place of St. Cuthbert. 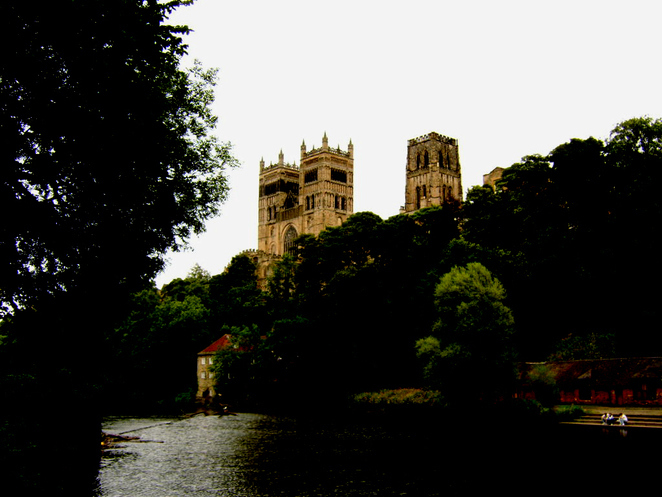 It is said that pilgrims carried the remains of St. Cuthbert for a thousand miles around Britain before coming to rest at the current site of Durham Cathedral in AD 995, which was then called Dun Holm. As with many medieval cities, the streets are cobbled and the ascent to the cathedral is steep, but it is well worth the visit. Some of my favourite parts of the Cathedral include the bronze door knocker which was used to request sanctuary by those who needed it and the magnificent stained glass windows that depict sacred images and stories from the Bible – designed for an age when much of the population could not read or write. The beautiful golden altar is central to this soaring edifice while the tomb of St. Cuthbert lies in a tranquil spot up a short flight of steps. On one wall within the cathedral you can see the names of all the previous bishops dating back to Anglo-Saxon times. You'll find it fascinating as the names on the roll change from Anglo-Saxon to French (under Norman influence) to the present day English ones. The most recent incumbent of the post of Bishop of Durham, the Rt Reverend Justin Wellby, has, just this year, become The Archbishop of Canterbury, the highest position in the Church of England, leaving the post temporarily vacant until a new Bishop can be elected. Another interesting place to visit inside the Cathedral is the Chapel dedicated to the county regiment The Durham Light Infantry, whose ranks were swelled with locally born soldiers who fought bravely in all the major campaigns of WW1 and WW2 as well as in Cold War conflicts. Staying within the Cathedral, there is a Refectory café and a gift shop selling souvenirs and items such as Celtic jewellery as well as various publications about the history of Durham and the Cathedral. And, if you're feeling really energetic, you can climb the 300 steps of the tower to the roof of the Cathedral for stunning views over the city and the surrounding countryside. Entrance to the Cathedral is free, although donations are kindly requested. As if this is not enough to whet your appetite, there are other attractions in Durham, such as the medieval castle, the Durham Light Infantry Museum and the Botanical Gardens as well as the wonderful medieval city itself, with its scores of academic book shops and antique curiosities as well as high street stores, cafes and bars which evoke the bustling atmosphere of days gone by. Additionally, there are beautiful riverside walks to enjoy and a modern shopping centre. Durham can be reached via the A690 just off the A1(M). Look out for the signs stating that this is the 'Land of the Prince Bishops'. Due to the historic nature of the city there are parking restrictions in place to avoid congestion within the narrow city centre streets. It is advised that you use the Park & Ride facilities available to avoid congestion charges. You can also arrive by train via the main line Railway Station which is served by trains from London Kings Cross to Scotland, Cross-Country and Trans-Pennine services amongst others. Newcastle airport is approximately twenty-five miles away while the city of Newcastle-upon-Tyne is 15 minutes by train or a 30 minute drive away. Buses linking the Railway Station with Durham Cathedral run regularly throughout the day, calling at Durham bus station, market place and coach park. They are wheelchair accessible and are highly advised as there are steep climbs between the railway viaduct and the cathedral. The city centre bus station is on North Road and offers services to towns and villages in the surrounding area.